Every satisfied customer of yours should bring you more customers. The ideal is for word-of-mouth to do all the work—for your happy customers to refer their friends to you, who in turn become customers. Not having to advertise in any way is the best. But what if you’re not quite at that stage? That’s when the next-best thing needs to happen: for every happy customer to influence potential customers. More specifically, short of having your customers actually deliver more customers to your door, the best thing is for your current customers to sway potential ones by writing great reviews of your business. Let me put it another way, using a new-agey metaphor: The goal is to re-channel as much positive energy as you can. It’s like karma, man. You work your tail off to do a super job. Sure, that’s its own reward, because you get paid and your customers get what they wanted. Everybody’s happy. But is that the only reward you get? Or do you also get at least a little public recognition for every great job you do? Without reviews, it’s harder for people to conclude that they should pick you over your competitors. 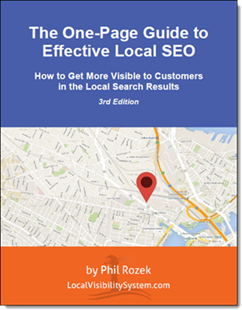 Plus without reviews you’re far less likely to outrank your competitors in Google Places and Bing. The bottom line is you need to ask each and every happy customer for a review. But how? This is where even the smartest business owners—the ones who know how important reviews are to potential customers—often get stuck. They’re not sure how to ask customers or how to show them what to do, so the reviews never happen. Fortunately, you’ve got options. 21 of them. I know of 21 ways you can get reviews—reviews that customers either write directly on your Google Places page (AKA “Google reviews”) or write through third-party sites (like Yelp and CitySearch). Many of these methods also give you a way of including instructions for people who may not know how to leave you a review. Organic method—making sure your business is listed on as many third-party sites as possible, so that customers can find you if they feel like writing reviews spontaneously. One place to start is by making sure you’re listed on all the suggested sites on GetListed.org. Autoresponder email—if you have your customers on an email list through a service like AWeber, you can have an email request for a review that goes out automatically. ReviewBiz button—a great way to get an extra trickle of reviews from customers who go to your site. Video—a short walkthrough, for customers who you think would just rather watch a quick video than follow other types of easy instructions. Social media—in particular, Facebook. What’s nice is customers can write CitySearch reviews using their Facebook username, which makes it that much easier for them and you. On-site “review stations”—just a laptop set up in your office / store that people can write a review on. This isn’t against the rules of Google Places, but just don’t ask people to leave you Yelp reviews through the same IP. Paid services—like CustomerLobby or DemandForce, which contact your customers for you and help get some reviews posted. Reverse side of your business card—on one side of your classy engraved business card is your basic info, on the other site a QR code or link that goes to a review site of your choice. A “We’re a Favorite Place on Google” decal—which you could put near the “Exit” side of your door. A slip or insert included with your product. The slip could simply be a piece of paper with a request, but ideally it would also include some instructions for people who may not know how to go about posting a review. Part of a little gift that you send customers. Like a free pad of paper with your logo and phone number on it, plus a request to leave you a quick review. Or a fridge magnet. A pen might be a little too small. The gift has to be something people will actually use, keep on their desk or kitchen table, and see every day. The idea is it’s a subtle but persistent reminder. Encouraging reviews in the responses you write to reviews on your Google Places page. Some fraction of the people visiting your Places page will be your current or past customers. They’re likely to read the reviews on your page, as well as your responses (which you should be in the habit of writing!). This is an opportunity to encourage others subtly to write reviews, too. I emphasize subtly. Asking family members of customers who already reviewed you. Let’s say you’re a jeweler and your latest customer just bought a really nice engagement ring for his fiancée. The gent has one perspective to offer (“Great service, really helped me pick out the ring”) whereas the lady also has a unique perspective (“I love the ring!”). Why not? Even though it’s one transaction, they’re both customers. The only caveat is this only works well when you’re dealing with close customers. Asking your reviewers to write through a variety of sites. In other words, if you know for a fact a given customer wrote you a Yelp review, ask that person to write you an InsiderPages review, too. There are no rules against it, and it’s plenty kosher. In fact, the review sites themselves share reviews: I’ve seen CitySearch reviews show up on Bing, Judysbook, Kudzu, MerchantCircle, Switchboard, Yahoo, YellowBot, and YP. Again, I suggest you only do this with really close, really loyal customers who don’t mind helping spread the good word. By the way, if some of your customers just don’t manage to give you reviews, but they’re kind enough to write you testimonials, put them on your site. And mark up the testimonials with hReview microformat, so that you can get those groovy extra “review stars” showing up whenever your site shows up in Google’s search results. Make every customer happy, then make every happy customer count. What review-gathering method(s) have worked best for you so far? Can you think of any I didn’t? Go ahead…leave a comment!